The first point of this post is that this is not news. It happened about five years ago or so. But it took me a few years after it occurred before I visited the site, and then a few more years before I got the idea to put a photo comparison here. Of course, archaeological sites are being destroyed all the time, but not usually sites that are well-known and extraordinary. Sites are destroyed by 1) building contractors who don't want the delay that would be caused by an excavation of their property; 2) looters who are looking for artifacts to sell; and 3) vandals. My guess is that the frequency is in the order listed. I used to think that I took good photos in Hezekiah's Tunnel. I remember when most people's photos didn't come out and mine did (because of the difficulty of focusing in the dark). That was back in the days when I was mainly shooting students in the tunnel for the early IBEX website. But yesterday I had the chance to shoot some photos of the tunnel without students; ones that should have more general use. 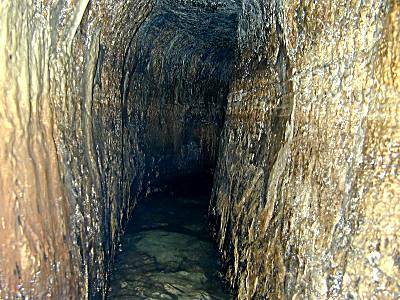 As of a few years ago, this was my best shot (currently on the Hezekiah's Tunnel page at BiblePlaces.com). It was used a few years ago by NationalGeographic.com when they did an article about the tunnel. This is one of the shots I took yesterday. I think it's better. Curiously enough, some poster on a forum at dpreview.com asked a question a couple of days ago about how to get a good photo in Hezekiah's Tunnel. Now that I had done some experimenting, I had an answer for him. I'm being asked for my opinion on the latest archaeological discovery: the "earliest church" found at Megiddo (AP story, Washington Post, photos and more photos). Frankly, I'm not all that excited. Here's why. 1. It seems like every few years the "earliest church" is discovered (in Jordan). Of course, they mean the earliest church building, and that means a building which is decorated with things which I do not find necessarily helpful nor biblical. 2. Israel has plenty of ancient churches, chapels, and monasteries. They are everywhere, and usually in exactly the wrong place. Many of them have beautiful mosaics, like this one. Thus the only thing that makes this "newsworthy" is the claim that the church is from the 3rd century (before 300 A.D.). Now that would be remarkable, since Christianity was a persecuted religion until about 310. I suppose I can imagine a group of believers meeting publicly in Israel (far from the Roman center) at this time, but it is harder to imagine them building a lavish structure. Perhaps this will help to re-write history. And if so, that is fine. But I also confess that I am a bit suspicious of the claim, knowing as I do, that this would be a non-story if it were a few decades later. Knowing that the archaeologist can get a lot of attention out of this and quite likely get the site preserved on the basis that this is a unique structure. Perhaps it is, but I see too many other motivations for preferring a lower date if the evidence is ambiguous. 3. Even if it were everything claimed for it, I still wouldn't be very excited because it's just a church building. I don't see how it is going to help me to better understand any of the things I care about, including the Bible and theology. That doesn't mean it's not important, just that it's not important to me. Today, however, was a good day of excavating in the City of David. There will be more news about the work there in the years to come.